August Sale: Crash Protection and Tire Repair Bundle! While returning home on a recent trip, I ran into some pretty severe thunderstorms. I was headed up over the Blue Ridge Mountains making my way to the highway (schedule limited) and it started to POUR. Like, toad-choker kind of pour. So, I made my way to the nearest pull-off to don the rain gear. There was a nice open parking area that looked well-enough. The kickstand pushed right through the chips and fell onto its side. This time, it was in a slight dip, was loaded up with another 50 lbs of gear and luggage, and was POURING rain. Everything in the top case was laying on the ground, also getting poured on. I don't know when I'll laugh about this, but it isn't today. 500 lbs of wet bike while in full gear (with rains)...ugh. 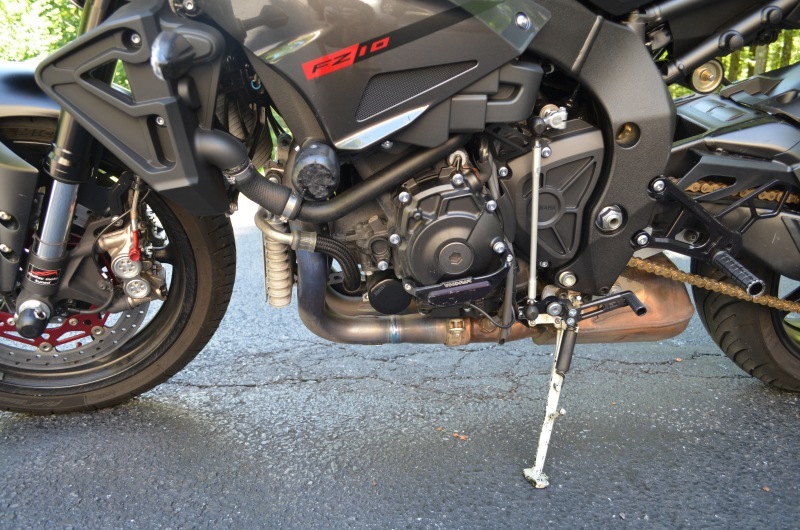 The good news is that the Woodcraft frame sliders, engine protectors, axle sliders, and rearsets kept the pricey painted surfaces off the ground. Aside from being covered in gooey tar, the bike was unscathed. Thank God. As you can see, the damage was limited to the nylon pucks on the frame/axle sliders and the aluminum skid plate on the engine protector. The tip of the rearset peg is scratched, too. The 8 hour ride that followed my aqua-infused deadlift session got me thinking. Back in June, I picked up some debris in the rear tire while on a dirt road. Yes, that is a piece of hex stock - the end of a bit driver! As you can see from the picture, it's good to be prepared. After a little fiddling, the Dynaplug kit and air compressor had us back on the road. Moral of the story? It's good to be prepared. If it weren't for the crash protection and tire supplies, both trips would have been MUCH less enjoyable. 1. Buy a set of our Woodcraft Frame Sliders. 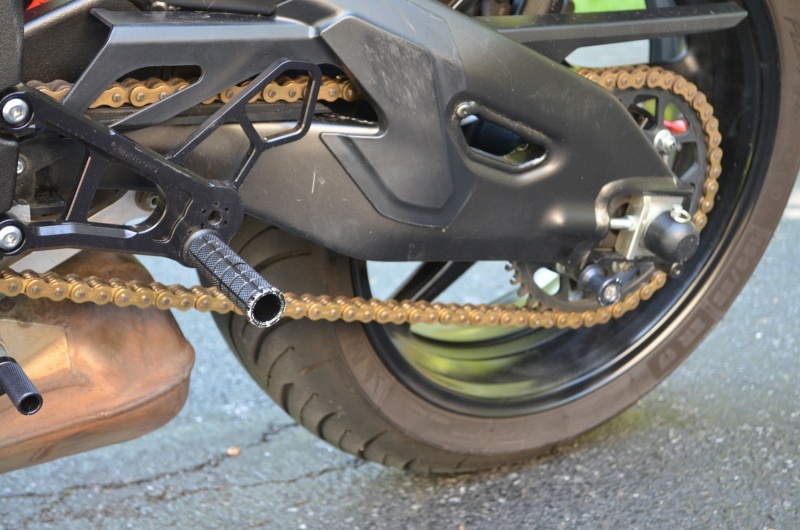 For those who aren't familiar with the DynaPlug kit, check our link (above). Easy plugging that can be done on the side of the road. 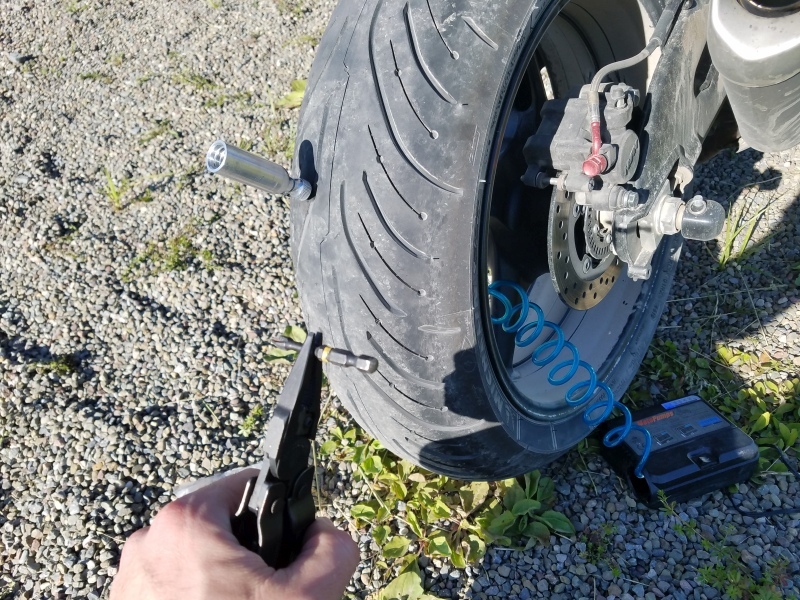 No need to dismount the tire to patch and the plugs can be double and triple layered for big holes (like what happened here). Add the items to your cart and use the coupon code SPORTOUR2017 to deduct the value of the Dynaplug kit. Sale ends at midnight eastern time 8/31/17!